Insects can ruin a camping trip. You need a Repellent which works. These guys are the solution. There has been a move by the touchy-feely crowd to bombard us with ‘natural’ ones which will see you eaten alive. Be warned. The product must have Deet (not so much it melts your raincoat, but lots). 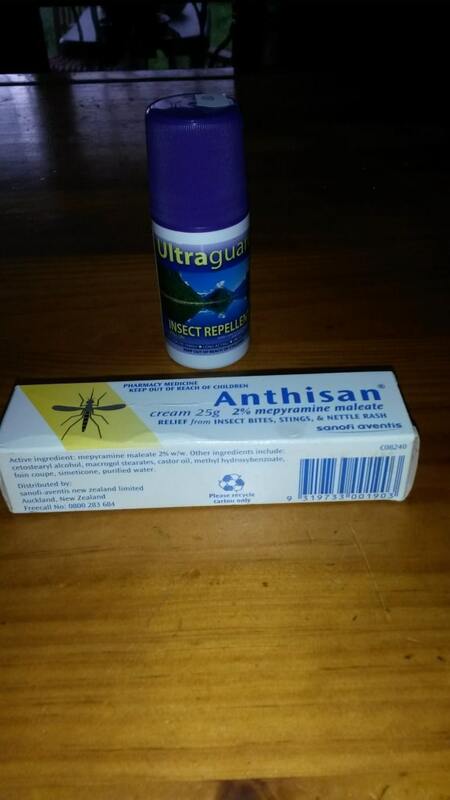 And if you are going somewhere which you know is seriously infested (eg with murderous giant sandflies – like the West Coast and Fiordland NZ) then it’s good if it also contains another repellent as well, eg Dimp. I usually use Ultraguard which has 30% of each! If you are allergic to either of these products, stay home! Even so, you do get bitten occasionally (and those NZ sandflies can turn me into something which resembles the surface of the moon – only monstrously itchy!) Unexpectedly unprotected spots need to be considered. The part of your hair. Most caps, for example, have a gap where they adjust at the back. Some hiking shirts are (thoughtfully?) provided with (non insect screened) vents. Some materials are too open-woven so that those nasty probosci can punch right through them. I choose close woven lightweight nylon in those circumstances, even though you end up smelling like a horse! Wool is better. Icebreaker has a nice new shirt, the Departure 2 which should be considered. If you are going to sleep in a tent, make sure that it has the finest nano no-see-um bug mesh which excludes all the nasties (including leeches). I might even consider sleeping in such a tent if I was camping in the Canadian Arctic (eg canoeing the Kazan River) as the blackflies are simply murderous there. ‘Warmies’ also seem to be unaware that the chiefest ‘problem’ facing Arctic explorers (save cold and polies) were mozzies and (in the past) malaria! I generally only take a 16 gram Sea to Summit head net to ward off biting insects. Unless you are going to retreat permanently to a bug-sprayed tent, you’re going to be out and about with the little guys most times. At least a head net gives you all-over cover at nights when the rest of you is in your sleeping bag.